What ring should I wear and where should I wear it? What ring do you choose? And having chosen the ring, what finger do you wear it on? What, if any, is the meaning of these choices? Rings and the stones in them are symbols in themselves with particular significance and power. Here is an attempt to offer a simplified but helpful guide to the understanding of this little-understood subject. The placement of a ring on any finger may be seen as a kind of filter. We could say that the particular finger has certain innate qualities which the ring will qualify, enhancing, channeling or diminishing those natural qualities. Thus when we place a ring on any given finger we would do well to understand how we are filtering the inherent qualities so vital to our well-being, our self- expression, our emotions and our thoughts. * For left-handed people, the following will be opposite. When we look at the hands and consider the placement of rings, the first thing to consider is the simple fact that we have two hands, the right and the left. The left hand is the receptive hand, the right hand the active, the left hand the yin, the right hand the yang. When we place a ring on the left hand we are bringing into and receiving within our bodies and our lives certain qualities that are associated with the particular finger of that hand. When we place a ring on the right hand we are focusing on the creative and dynamic aspect of giving, sharing, creating, the qualities associated with the particular finger. With the left hand we receive energy. With the right hand we give energy. There is a balance here and both aspects are necessary for our well-being. The two hands may be thought of as a balance between receiving inwardly the energy and vital forces you need in order to move forward into creating and building the structure of your life in the outer world. An interesting example is that in some parts of the world a wedding ring is worn on the left ring finger (Apollo) and in other parts of the world the wedding ring is worn on the right ring finger. Thus different peoples are emphasizing either the receptive aspects of relationship, marriage and family while others emphasize the more active, dynamic aspect of marriage. Each of the fingers represents certain qualities which in themselves are generally quite positive but when over-emphasized or taken to an extreme may turn negative, sometimes extremely so. Thus the ambition and self-confidence of Jupiter may transform into arrogance and greed. The swift-thinking and intuitive Mercury with all its communicative skills may flip to the shadow side and become the con artist. Each finger with all its qualities has both positive and negative possibilities and one should be aware of these in the placement of particular rings. The effects may be subtle at first but over a long period may have profound effects. Self-confidence, ambition, leadership, executive ability, leadership, sometimes spiritual or religious. In the Jupiter finger we focus on the most outer aspects of life, our relationships with others and the power sharing balance that takes place there. Any emphasis on the finger of Jupiter will tend to bring out the qualities of leadership, executive ability, ambition, and self-confidence. The Jupiterian personality is strongly driven and find themselves placed in executive roles often in spite of themselves. This is also the place to find the energy for material and financial motivation and gain. The Balance Wheel, sense of right and wrong, the law, search for truth, propriety, self-analysis, secretiveness. Saturn has been called “the balance wheel” of the hand or the personality. It is here that we find the qualities relating to universal and human law and justice and our relationship to them. To emphasize the role of Saturn is to emphasize the sense of what is right and wrong, what is proper in any given situation. Other qualities related to Saturn are a certain tendency toward introspection. Saturn in its extreme can develop into a tendency to secretiveness. Saturn carried too far tends to be weighty, heavy and sad. My own palmistry teacher used to say that “everybody has more than enough of the qualities of Saturn.” It would be rare that a person would want to bring greater emphasis to this particular aspect. Love of beauty, creativity, expression of self, relationship with others​. 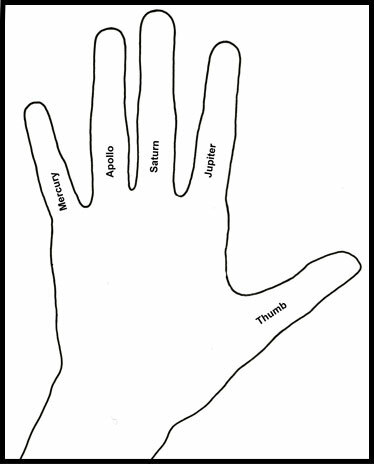 Apollo is called the “ring finger” for good reason. Its qualities are some of those which are best emphasized and which most benefit from the wearing of a ring to emphasize those qualities. Apollo represents, above all, creativity. It is creativity in artistic expression, in craftsmanship, indeed creativity in every endeavor of life. Apollo is the cultivation of the love of beauty in all its forms but especially of the natural world. Apollo represents the “tree-hugger” in all of us. Apollo is that energy within each of us which gives rise to expression of self on every level It is supportive of all other energy and lends them grace, beauty and compassion. Mercury is the energy of communication. Think of Mercury as your antenna both receiving and transmitting. Mercury is your communication skills not just verbally but in every way. Receptively, Mercury is your intuition, way you receive all information, all data, and with what sensitivity you receive that data. Strong Mercury skill manifest as what we see in our times as bright intelligence. Easily carried away with itself, Mercury can turn into the con artist quite easily and this not only towards others but towards one’s self. Be wary of what filters you might want to place on these important functions. Picture the giant diamond sparkler on the hand of the Mafioso. Stones that feel soft, soothing. significant, symbolism meaning and beauty and may be chosen through intuition. No guide can substitute for your own highest intuitive wisdom! When you get up in the morning and choose what you will wear for the day that is a very personal choice. Perhaps it seems at any moment not so important and yet on any given day that blue shirt is just not right, the gray dress is perfect, the white belt not so good. We honor our intuition in these choices. Another day all these choices may feel quite different and it is our intuition that tells us what is right for this day and what is right for another day. So it is with the choice of rings, what ring to wear and which finger to wear it on. So we give a nod to this, our fundamental intuition in these matters. However, we must acknowledge that with rings and the fingers we wear them on, the matter is somewhat different. For most of us we choose a ring out of some deep-seated feeling and the ring and the finger we place it on often remain the same for many years, sometimes for as long as we live. We feel deeply about these choices. A ring may be deeply meaningful. From these small pieces of jewelry we may draw solace, healing, courage, memory, even power and , yes, enhancement of emotions such as love and loyalty. So here we offer a guide. This guide is not meant to replace the intuition of the wearer. That deep allure that you feel to some particular ring, the metal, the stone, the design. These things must be honored as must be the magnetism of that particular ring to that particular finger. Rather this is a guide to the understanding of the placement of the rings on particular fingers, what powers or energies or emotions may be enhanced or channeled or even somewhat blocked by the wearing of the that ring. It is understanding that is offered here. Not dogma. So please honor your own intuition and take what is offered here as information to enhance and deepen that which your heart already knows. A note on the author: Tom Durbin began his study of Palmistry under the tutelage of Frank Douglas (Sashwa) a noted reader and healer in the San Francisco Bay Area and beyond. Tom read professionally from 1977 until 1989, reading , teaching palmistry and practicing the art of healing with stones and giving “Ring and Gemstone Readings” on a regular basis. He continues his studies at his home and workshop in Grass Valley, California working to create jewelry pieces for Wellstone with metals and gemstones for meaning, transformation, healing and beauty.